Kevin Hendricks is someone I would love to grab a coffee with. He gets the interwebs and his latest project ... which I am a bit late on (apologies) ... is a real inspiration to me. 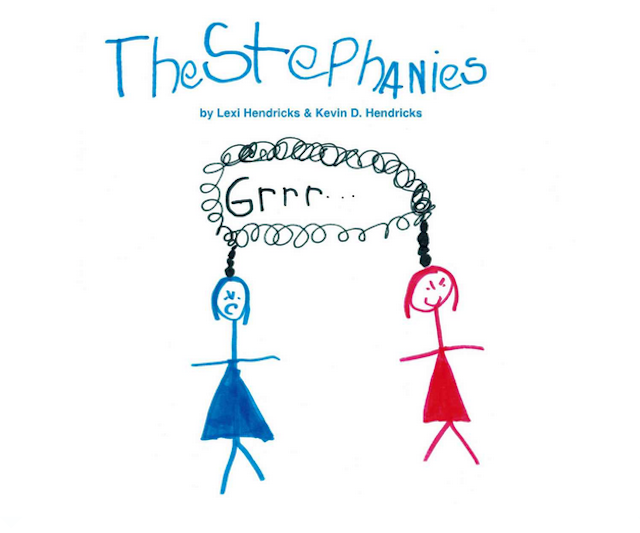 "The Stephanies" is a book written together by Kevin with his 6 year old daughter Lexi ... with illustrations from Lexi. I love it ... albeit I am not their target market. I love it because it is an awesome artefact ... a reminder of a time when a father and a daughter worked together and made something happen. Their experience has 'edges' ... it has substance ... it's more than memories and photographs ... it has physical form. I find that inspiring. I love it because it is really good. I love kids books and have a few in my collection at home. The best thing about kids books is they can and are a great canvas for cutting edge illustration and storytelling. I'm not suggesting Lexi is a cutting edge artist ... yet ... but children's books are far more accommodating and accepting of a wide variety of expression ... and, to be honest, what better than a child illustrating a child's book ... there is a real 'on the level' thing here that I find delightful. I love it because they made it happen. Kevin is a knowledgable chap and he knew what services to use to make this dream come true. First off ... he used Kickstarter to crowdfund the process. I think they doubled their request ... and really got into the spirit of Kickstarter with some awesome incentives. I really would have liked a batch of those home-made cookies! Kevin then used Amazon's CreateSpace service to create physical copies to add to the Kindle copy he created using tools such as Word and Photoshop. Which brings me to my final point ... I love it because Kevin and Lexi could make it happen. Theirs was and is a 100% independent production ... funded by kindness and generosity ... but created using easily available tools. Tools that need a bit of savvy to use but tools that give the opportunity to ordinary folks (not saying Kevin is ordinary ... far from it) with the willingness to learn the ability to do what Kevin and Lexi have done. I think this is a prime example of how publishing is changing. Self-publishing is accessible to the masses ... or at least ... out of the hands of the gate-keeping Publishing industry. Yes ... Amazon are now the gate-keeper ... as are Apple ... and Barnes and Noble ... but they are enabling folks too ... giving them the tools to create. Who knew I'd have my own netlabel this time last year? Its that kind of thing. The opportunities have changed and its savvy folks like Kevin with his adorable daughter who are paving the way for others to follow. Well done Kevin ... Well done Lexi. I look forward to your next project and Lexi ... I really hope you keep on drawing. Watch them read 'The Stephanies' together below ... and if you can ... please support them by buying a copy. For more details ... go here. Thanks for the kind words. I agree that the simple fact we can make it happen is pretty awesome.